How's it going to look once I put it up? Will it look right? If either of the above questions are troubling you then don't worry I think I have a simple but very effective solution to your concerns. I can show you exactly how it will look in the very location you plan to use it! How cool is that? What's more, as a jolly helpful fellow I'm happy to trial this service for free -so long as I'm not inundated with requests as it does take time to work it all out. If you e-mail me the items below I can produce a full colour location shot of the chosen artefact as it will look in the location you intend to place it. 1. a location shot of where you plan to place the artefact. 2. a dimension of one of the elements in your location shot you are sending me (eg the actual width or height of mantle piece/dado rail/what-ever) so I can scale the artefact to the right size. 3. the name and finish of the artefact(s) you are interested . This approach can also help clear up other questions that may be troubling you. Which artefact or finish should I go for? 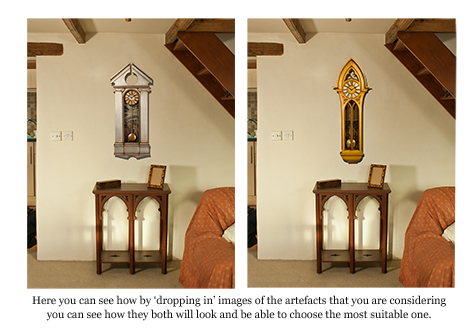 If you're unsure between which clock, mirror or finish to go for then let me know which artefacts or finishes you're interested in and I'll show you how they'll both look by digitally dropping them into a location shot of where you are thinking of using them. All I need to produce your location shots are the three items list above. Will it be the right size and proportions? These are key decisions to get right -especially for large overmantle mirrors or awkward locations. 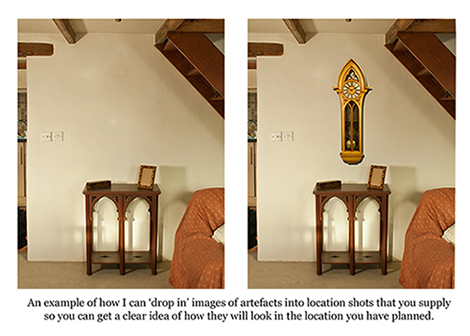 By digitally ‘dropping in' an image of the artefact of your choice into a location shot of where you wish to place the piece this problem can be very effectively resolved. Again, you'll have the assurance that you've got the right proportions for the job and know how it will look once it's finished. Naturally we can adjust the proportions until we are happy we have got it right. I'm here to help with advice if you need any and I can put forward alternatives artefacts for you to consider or suggest the right proportions to customise the piece to suit the location you have in mind. Just let me know what help you need and I'll be happy to oblige! With this approach, I believe that you'll be able to resolve those reservations you may have and be able to confidently place your order knowing you have made the right choice of artefact and that it will be in the most appropriate finish and proportions for the application you have in mind.